Commentary: The new head! 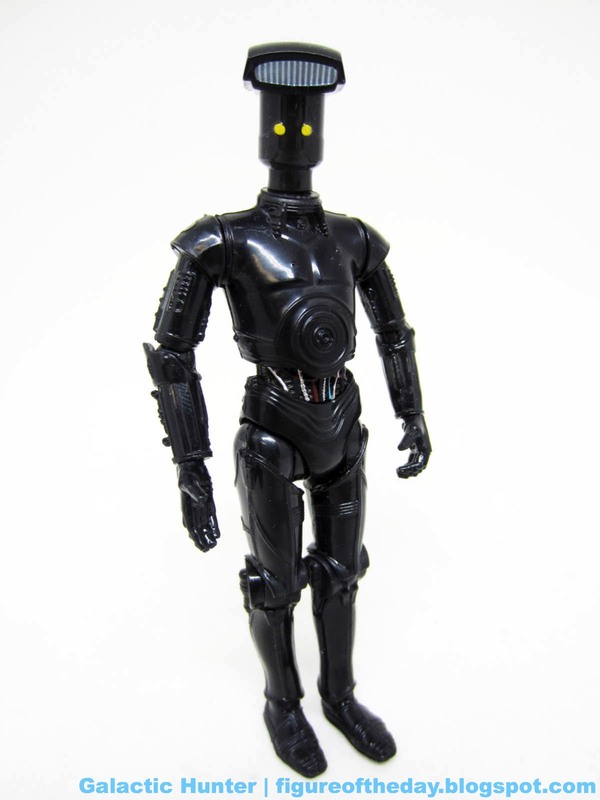 The Black Vendor Droid is basically the new head from The Clone Wars, now in a handy glossy black color. It has a big silver thing on its head, like a hat, with yellow eyes and whatever body you give it. The glossy black finish is super shiny to a ridiculous extent. It's gorgeous, and I wish I had a better display to show these sorts of figures off. It stands, it looks cool, it has articulation. You know the drill. So far I've only heard of these in Orlando, but I also don't pay super close attention so maybe they're in Anaheim by now. The droid is curious in that Disney opted to make this design in colors that were never actually seen on the show, so perhaps those are coming later. I can hope. It's still nifty and if we had a decent playset that worked for it, he'd be right at home. Collector's Notes: I got mine from Disney Hollywood Studios. Column Notes: We are going on a brief hiatus due to an excessive amount of travel and The Last Jedi launching - so we'll be back with new stuff as quickly as availability allows on or after September 1. 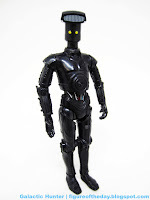 Until then, please visit Galactic Hunter and 16bit.com for more toy news and reviews and dubious opinions. Commentary: It took me a while to crack open Galen Erso because I didn't feel great about the line being over - and thanks to someone working somewhere, it isn't. It's merely one of the later figures. Hasbro did a great job designing this figure and a good job with the head - coming up with the right amount of scruff and sadness on a human face at this scale is a challenge, particularly when you have certain cost metrics to meet. The uniform is a good recreation of the movie, down to the science patch. The colors maybe could be better, but it's still good. It looks like Mads Mikkelsen, with a good sculpt slightly marred by soft detail in the plastic. It's clearly him, though. He has no problems sitting, standing, or holding any of his gear. The zipline fits in his hand better than any other in the line, although its design doesn't lend it to zipping forward particularly well. It's a good design though. 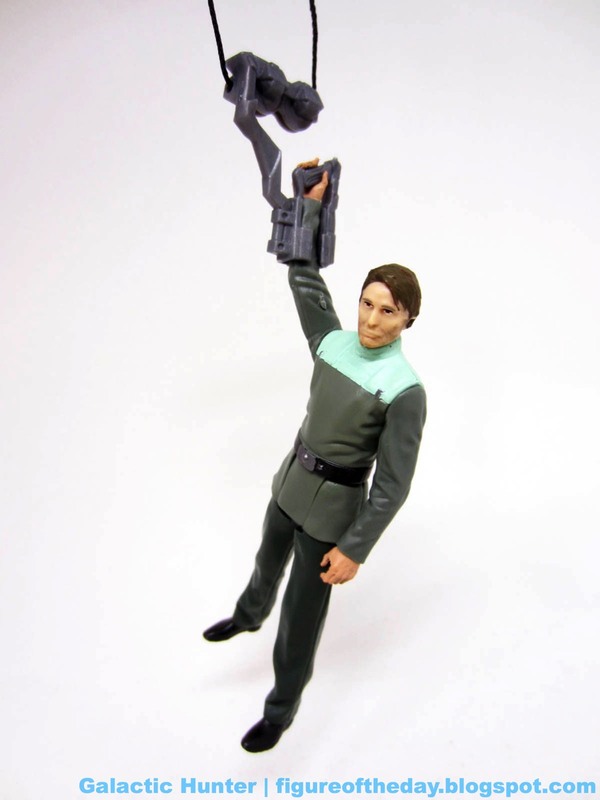 The blaster is classic fare, also fitting in his hand easily. What really makes the set sing is the mouse droid, complete with teeny tiny rolling wheels. 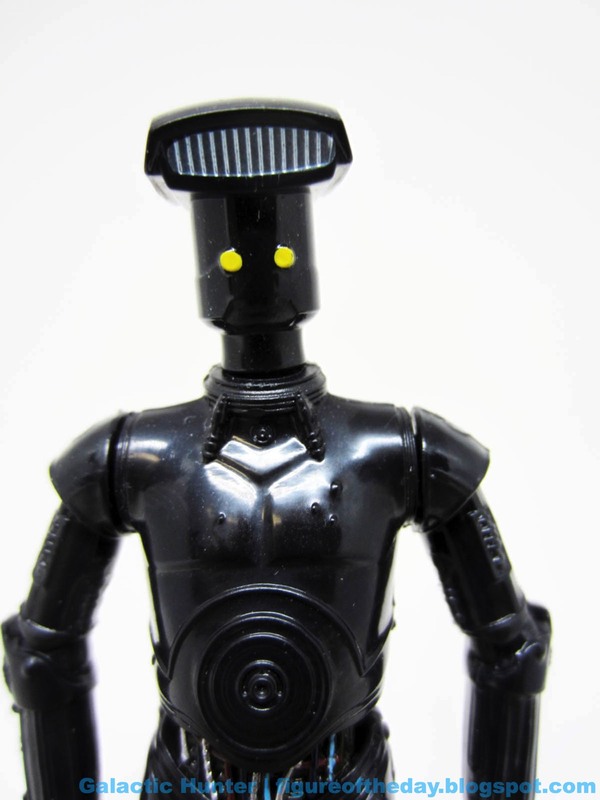 I think it's my favorite Hasbro mouse droid so far. It's fun, it's neat, and I'm kind of amazed it even came out - sometimes these tail-enders vanish. It's one of few (perhaps the only) scientists the Empire ever gave us as a figure, so it's nice. Maybe we'll get more some day. 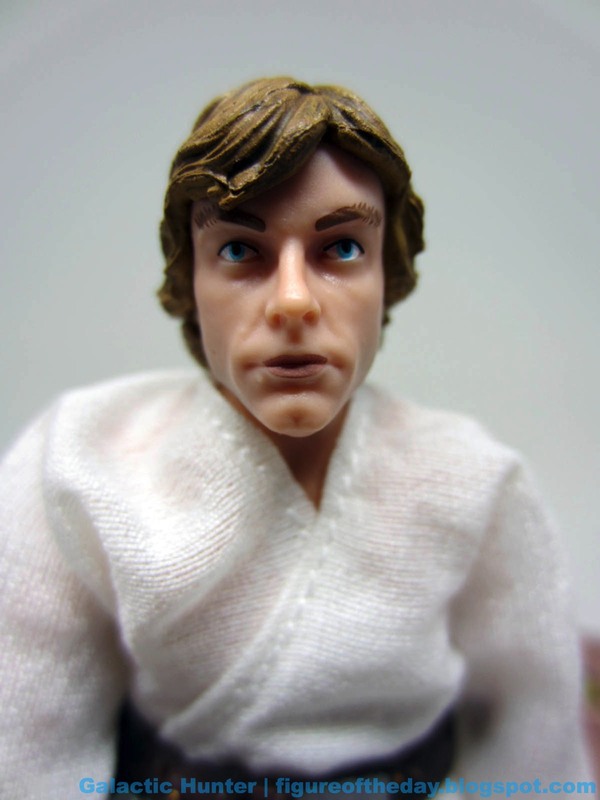 Commentary: There have been no shortage of 6-inch Luke Skywalker figures over the last year. A basic boxed version hit in 2016, and now this version hit Comic-Con in a really nice heavy-duty window box with added accessories and deco. A non-exclusive release of the vehicle is due out in about two weeks. 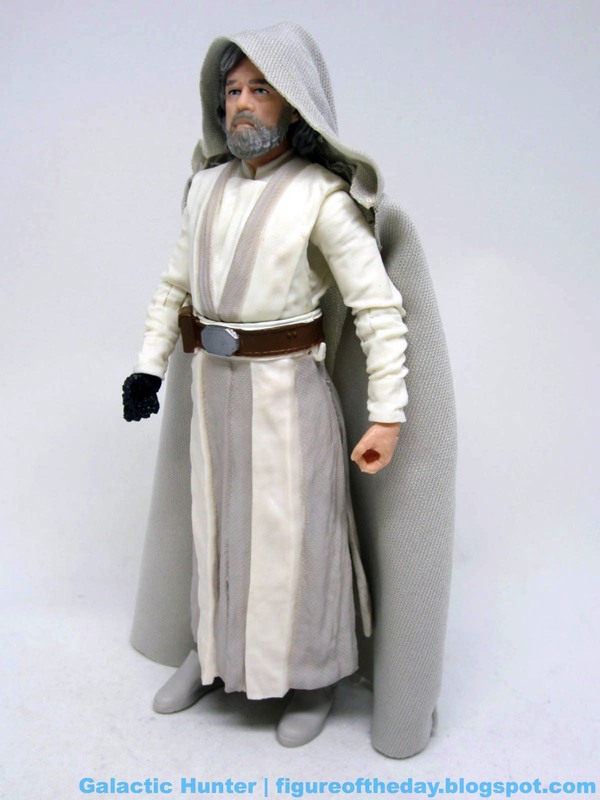 This new version of Luke should be similar to the next figure - but this one has more accessories. The figure's clothing has a different cut and a different texture. Depending on how you pose it, I'd argue this is the superior version. 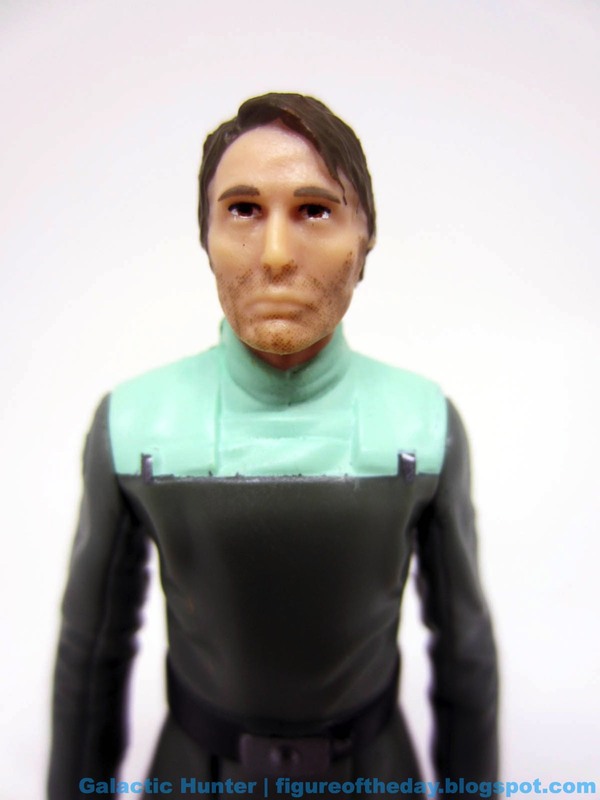 The plastic is a bit more saturated, reminding me more of the original Kenner action figure - sort of. The shoes and boots are lighter, as are the pants. His skin tone is a little less pale, and hte head is completely different. Now Luke has a less translucent face, wilder, darker brown hair and painted lips that I can't say are perfect, but are better than the previous release. The portrait is a little bit better, but it seems getting Mark Hamill's hair and face just right may be a scientific impossibility. Under the right lighting and at the right angles, this looks perfect - but otherwise, it's just pretty good. Overall, it's better. His gear includes everything from the previous Luke - Lightsaber, Macrobinoculars - and adds the hat and poncho. 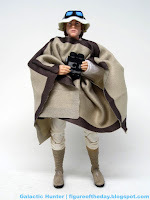 I'm not 100% sure but I believe the poncho is exclusive to this particular convention edition - plus you could give it to Qui-Gon Jinn, if you really wanted to do so. The figure's articulation is good, but the arm joints may pop off if you're not careful. They pop easily back in to place, and that's what matters. 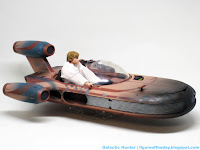 The Landspeeder itself is impressive, but gets one tiny detail annoyingly wrong. As you know, R2-D2 could be mounted to many of the previous Landspeeder toys, as that's how he was transported in the movies. The instructions show a hole to connect him, but it's in a different place on the final toy and doesn't quite work. Maybe the non-exclusive edition will fix this. Everything else is a blast. Pop off the windshield to pose Luke's hands on the controls. Two storage bays and an area behind the seats allow for storage of accessories. A clear plastic piece acts as a stand and something to give it the illusion of hovering, which is a surprisingly good alternative to the spring-loaded wheels we've been given over the years. It sports a clip for the rifle and an opening hood, complete with an engine with a spinning motor piece. The spinning element is exclusive to this edition, and probably shouldn't be a selling point if you just want a Landspeeder. I like this figure a lot - the added gear and vehicle make it great. As I believe I read the regular edition would be $60, it's probably not worth the premium pricing unless you're a completist, and I would probably say that about most 6-inch convention exclusives as of late. (Bless you, Hasbro, for not making new characters for the events.) It's big and impressive, in a nice box with a good heft to it. You can also display the vehicle in the box after defiling it - I appreciate that. Get it if you're so inclined, it's pretty good! Collector's Notes: I got mine from Hasbro Toy Shop at San Diego Comic-Con. Commentary: The big surprise of The Force Awakens may have been from its misleading marketing, distracting fans from the fact that Rey seems to be our new Jedi hero. The figure included BB-8 in her 6-inch debut and enjoyed subsequent variations in later releases, like a snow base and a lightsaber at Kmart and a bonus lightsaber everywhere fine toys were sold. 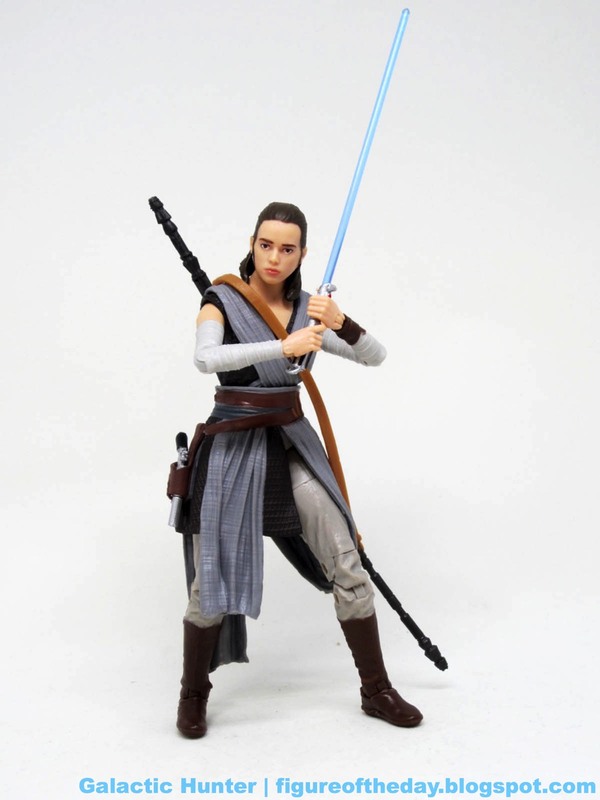 This is her first new change of costume at this scale, reminding me a bit of the Princess Leia Jedi Knight outfit from one of the Infinities stories. It's white, with grey and a tiny hint of purple. It works. It's good. 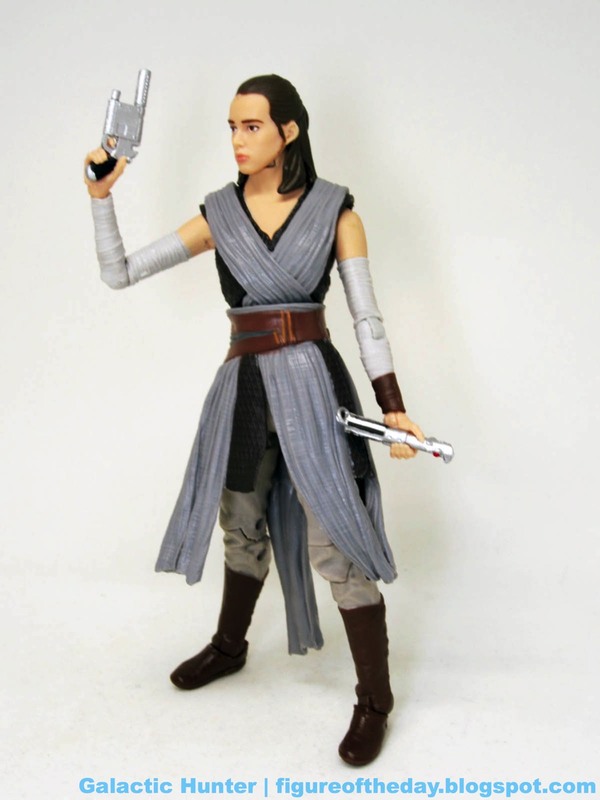 There are no cloth elements on this figure, but you do get a holster for her blaster and a removable blade for her lightsaber - sans hook, natch. This is a nice figure. I easily got her posed with the staff slung over her back, pistol in the holster, both hands on the lightsaber, and balanced with zero fuss. She stands well and it was easy to find her center of gravity. The figure has no new points of articulation, but she's great - the rocker ankles, bend-and-swivel wrists, and perfectly cut robes allow you to get the most out of this 6-inch scale action figure without a fight. This is rare - usually the joints have a little wobble and I spend time trying to get them to stand up properly. Not so here! Hasbro designed this one pretty much perfectly, and that's tough to do well. The sculpting is on par, although the textures are a little less pronounced thanks to the choice of the grey used to paint her arms and legs. The darker purpley-tinged grey on her robes brings out all the folds and detail, even in a dark room though. 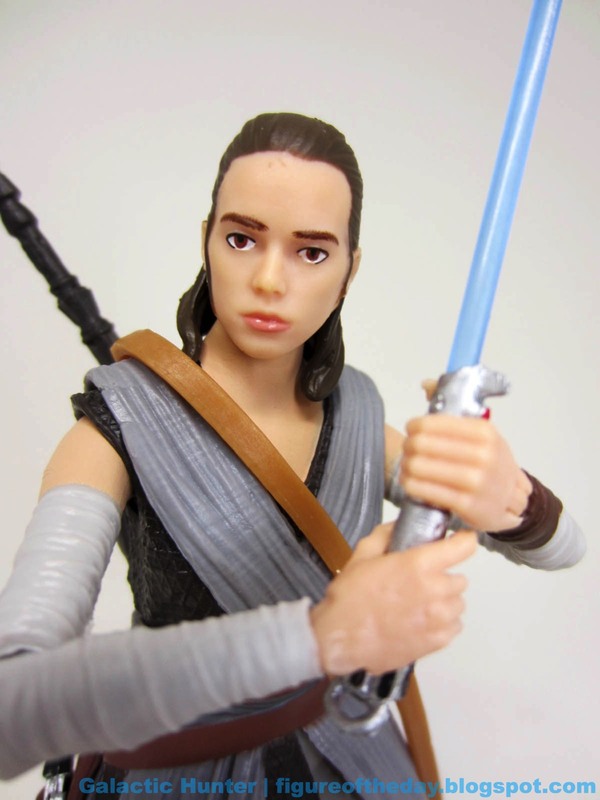 Hasbro gave her glossy eyes and lips, with the various brows and highlights painted on straight - they did a good job with the deco. The boots are nice, and her hair is held down and out of the way for more dynamic poses. 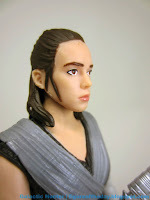 I feel hyperbolic saying "this is the best Rey Hasbro has ever done" but it's true. It is. I defy them to do a better one. (And by that, I mean I hope that they do, soon.) She has no problems looking determined, holding her accessories, or generally giving me no idea what the movie is about. 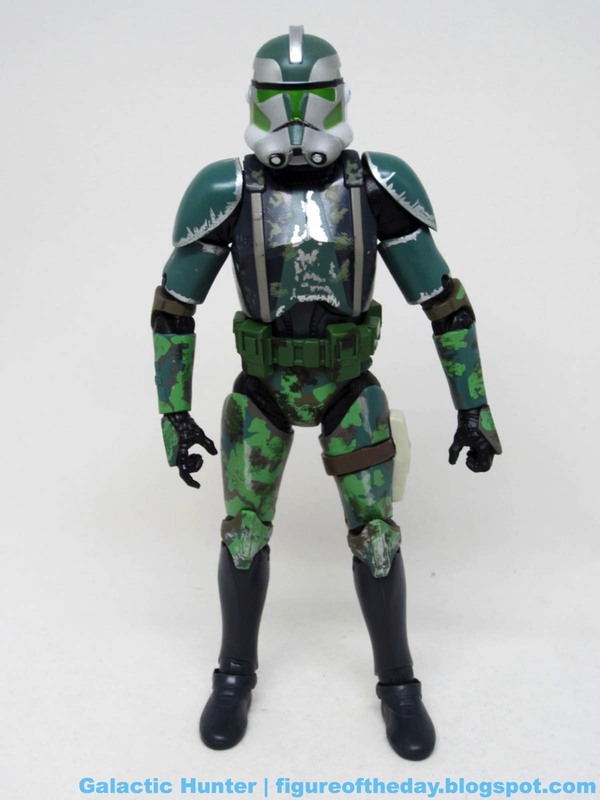 If this figure is available near you at a good price, or online, get it. Don't wait - get it. 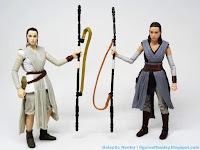 If you didn't get the last Rey, this one is better (plus or minus BB-8) with superior paint, a better range of movement, and overall similar articulation. Collector's Notes: I got mine from Hasbro Toy Shop at San Diego Comic-Con. The figure's date stamp indicates it was manufactured in April 2017, which means Hasbro has factories that are better at keeping a secret now. 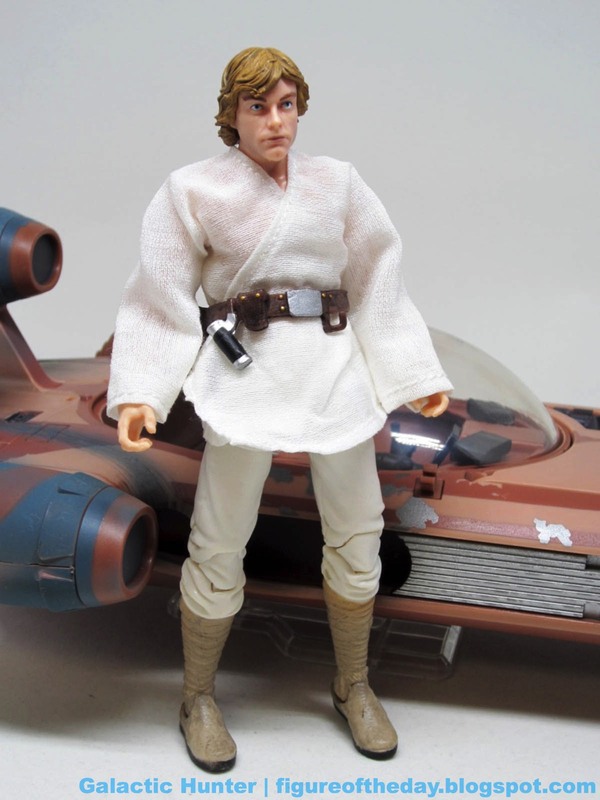 Commentary: If there's one figure fans were made didn't make The Force Awakens' launch window it's Luke Skywalker. When people asked "Where's Rey?" 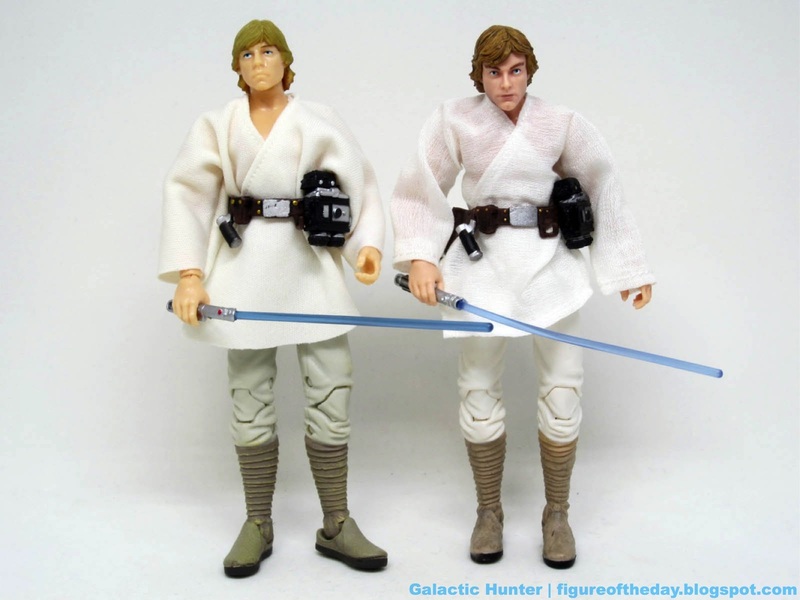 the answer was usually "Selling slowly until the movie hit theaters," whereas Luke's presence in the movie and the toyline wasn't questioned all that much. General Leia didn't make the cut, and Han Solo took a while - but Chewbacca was out on day one. Why? This sort of thing bothers me, especially since it'd be so, so, so much easier to sell Luke, Han, and Leia over Finn, Rey, and Poe. Back then. Now? I'd say it's a toss-up, mostly. 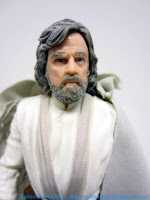 We're expecting Luke in the main line in about a month, so you should be able to get him in new packaging. And he's great. There's no lightsaber, but you get a cloth cape that hangs fairly well and is closer to what would look like a Return of the Jedi prop than something from the prequels. 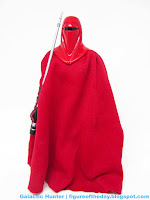 The cape is light and thin, and hangs fairly well. It's better than much of what we've seen in the past, but there's always room for improvement. 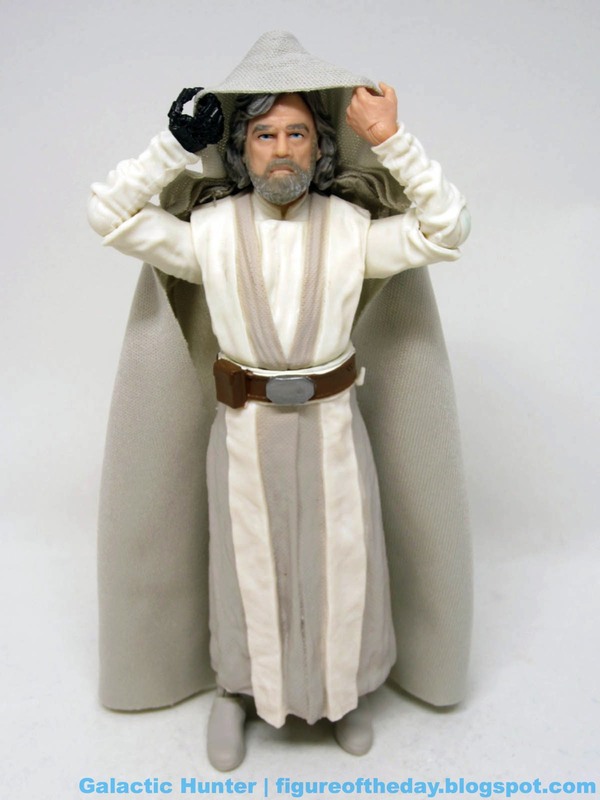 The figure itself is a lot like an Obi-Wan Kenobi. The long robes block some leg movement, but not to the extent where the generous leg articulation becomes worthless. He has double-jointed knees, rocker ankles, swivel thighs, and other bits that just aren't necessary given what the figure is right now. 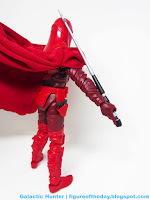 If he has a big action scene, I would hope they redo him with cloth bits and a lightsaber. The head sculpt is good with decent deco, but mine has some clear glue melting down from under his hair. 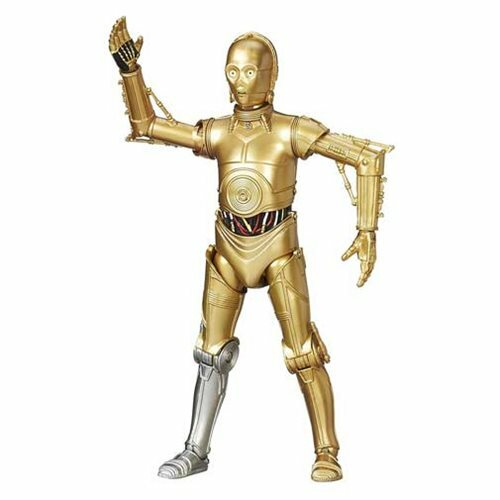 Arm articulation is par for the course, with bend-and-swivel wrists, elbows, and shoulders. It's Luke! That's all you need to know. 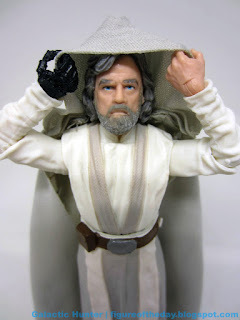 Do you want an old man Luke figure? This is one. I don't know if there will be other variations of it, but as it is, it's not bad. I like it enough to have got one at Comic-Con, and it's my hope the regular retail release is unchanged or only slightly different. Collector's Notes: I got mine from Hasbro Toy Shop at San Diego Comic-Con. The figure's date stamp indicates it was manufactured in April 2017, which means Hasbro has factories that are better at keeping a secret now. 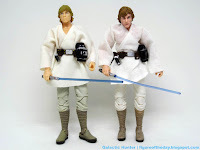 Luke's belt has a hook for a lightsaber, but the figure itself doesn't have one - perhaps Lucasfilm and Disney are keeping this secret for the main release, or an accessory with a future figure so we can arm Luke at that time? Commentary: Hasbro is taking it easy with the Clones in the 6-inch line. After several years, Clone Commander Cody is only the second commander from the final prequel to worm his way in plastic. The figure required some new tooling, with a new paint job that's sort of close to the movies. It's off a bit. It's really a good effort, were it a custom you might be OK with it. I assume we'll see a variant down the road. In terms of deco, the forearms and thighs are a bit greener as opposed to other figures and renders which tend to be browner. The visor is less metallic than many of the other high-end (and some low-end) representations. The damage deco is a little different, but other than that it's a good replica. It's not like it's really off - it's just different. The suspenders are painted, the ammo pouch (I assume) is painted, and the silver looks good. The torso and left thigh are newly tooled, with an extra pouch on the leg and some more changes on the body. 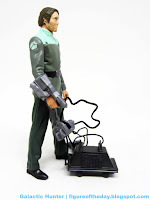 The most important one is the antenna - this is removable. Mine just fell out shortly after unboxing the toy. You'll want to be careful about this, because it's easy to lose. You may wish to glue it in place, or buy a second one for when you inevitably lose the first one. (I'm strongly considering buying a second one if it hits Toys R Us out of fear of losing it.) 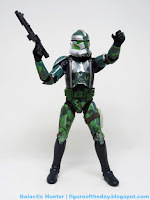 Articulation is basically the same as the other Clone Troopers, mercifully keeping the double-jointed elbows which have been largely bred out of the line over the last few years. 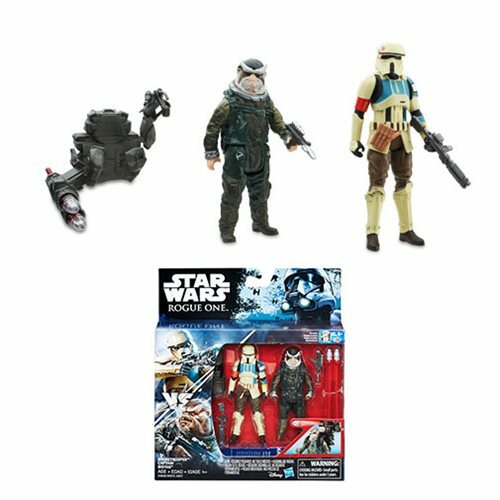 The two blasters are in a dark grey color with no decoration, making them a little different than you may be used to seeing on these figures. Joining them are macrobinoculars, painted heavily and easily held in his hands. 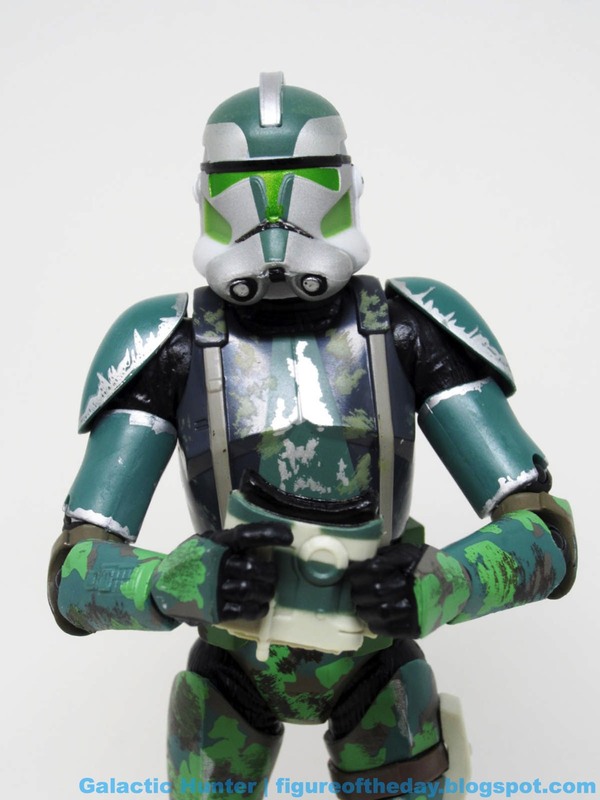 He can't quite get it perfectly up to his helmet's visor, but he can hold them convincingly in one or two hands. 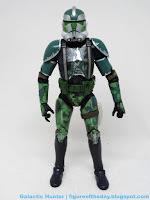 I'll give this 6-inch take on Gree the same praise I give a lot of first-timers. It's OK. For a 12-year-old-design, I would hope it'd be perfect... but it's not, and we still had errors in designs during the franchise's 30th anniversary. 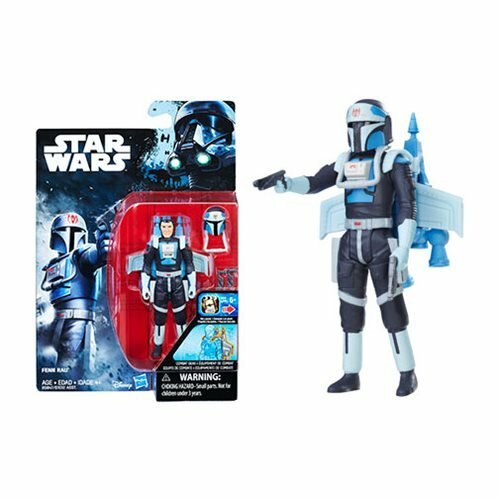 If we ever see clone commander multipacks with a deco variant, you may want to check that out first. 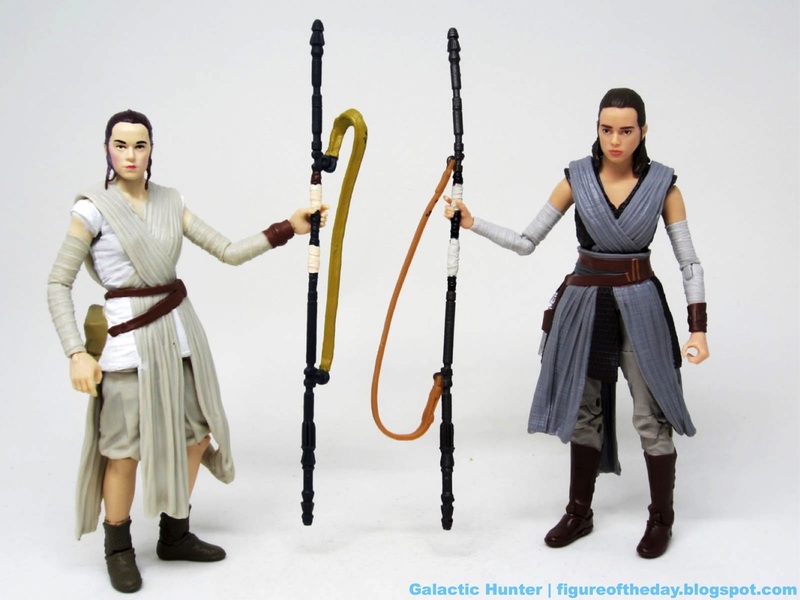 Failing that, this is the best version in this scale from Hasbro yet. It's decent and will look good on your shelf. Collector's Notes: I got mine from Entertainment Earth at San Diego Comic-Con. 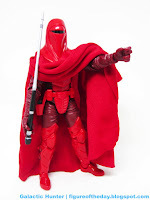 Commentary: What's sort of fascinating about the 6-inch Imperial Royal Guard (also Emperor's Royal Guard, Red Guard, Crimson Guard) is that the 3 3/4-inch version offers more. The 6-inch version is bigger and offers more heft, but if you want options the 3 3/4-inch Vintage Collection/Black Series version reigns supreme with shoulder armor, a human head under the helmet, and a double-bladed pike. 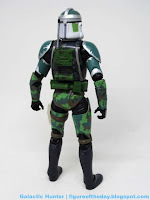 This 6-inch figure offers an experience that's a bit closer to the movies, in that you don't see much that wasn't on film - with one big exception. As I've never seen under the red guard's cloak, I only know that I heard in the original trilogy they had elaborate layers and tassels that few human beings outside Lucasfilm have ever seen. Thanks to the Crimson Empire comic books, now everybody makes merchandise of the figure with armor under the big red barber's tarp. You get a fantastic amount of articulation, consistent with other 6-inch offerings, and a level of sculpted detail that at this point won't surprise you. It's good. It's sturdy. It can stand. The helmet is glossy and doesn't pop off - it's a good piece for the asking price. A tiny blaster fits in his hip holster, and it may as well have been left out. It's too small - it's almost the same size as the 3 3/4-inch equivalent blaster. Authentic or no, sometimes you need to exaggerate the size of things for them to register a bit. This was common in the 1990s, especially in Playmates' Star Trek line where they actually explained on the packaging that the heads and hands were intentionally enlarged. I appreciate the candor. 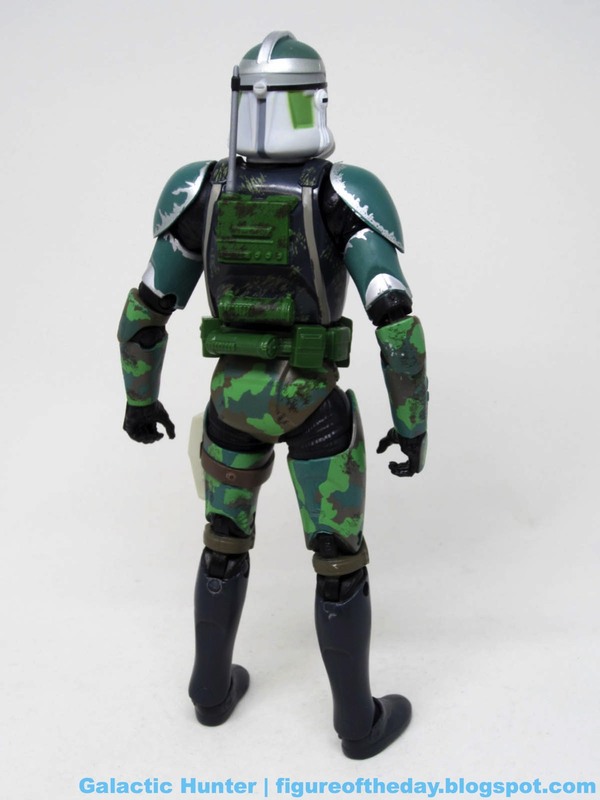 Good cloth elements are tough to do well, and I'd say Hasbro did an admirable job here. If you straighten out his cloak a bit, it looks pretty good - the soft goods material feels right in the hand, and hangs well. It's tough to get right, because if you picked the same material used on a 6-foot man it wouldn't look right either. 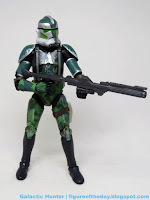 Considering all this figure needs to do is stand there, look red, and hold a pool cue, it's nice to see Hasbro sculpted the hand perfectly and gave it so much additional articulation that an aspiring customizer or even Hasbro could whip up other guards or Kir Kanos out of the basic figure design. It goes without saying that you want and may even physically need this figure. I want more, but am basically giving up army building in the larger scale to keep sane. If you se it at or near the $20 price tag, buy two. Buy six. Buy a ton. Your Emperor commands it. 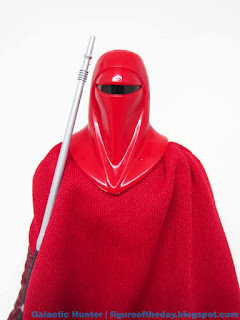 Hasbro has gone through many of the major Imperial troopers and guards quickly, and at this point the next one I would probably push for would be one of the Death Star Gunner figures. I hope you can find one, or pre-ordered one so you can get one.